Shearwigs (トビンコ?, lit. : "Flying Parrot") are enemies in the Pikmin games. The females of this species are never seen, as, according to Olimar's notes, they spend nearly their entire life underground, somewhat similar to cicadas. They also do not possess the males' wings. The males have a dark green shell, sporting simple wings and large, sickle-shaped mandibles. They are slightly more aggressive than Male Sheargrubs, and take leave off the ground to hover up high after having lost at least half of their health to allow it to steadily return. While up in the air, these creatures are still within the reach of a Pikmin throw, of which just one accurate button-press is enough to kill one. Like other mandiblards, Shearwigs have an affinity for chewing apart stick bridges, and they lose health while in water, in the first two games. Because when they are being attacked they fly up, they will stop losing health as soon as they stop being submerged. On the ground, if they are hit in the back, they will die instantly, just like a Dwarf Bulborb. The Shearwigs also appear in Hey! Pikmin, exclusively as part of the boss fight against the Queen Shearwig. In this game, they only fly around to serve as a line of defense, move towards a target while spinning, chomp on Pikmin, and eat them, all as commanded by the queen. In Pikmin 3, Shearwigs fly almost all the time while fighting and swoop down to grab Pikmin and eat them. Instead of healing while in flight, they roost and go underground, and can fully heal in 30 seconds. They will go underground to heal when their health reaches 20% or lower, and will emerge after it reaches 50%, if there are prey nearby. 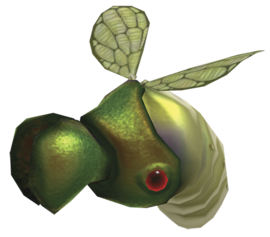 This makes them easy to strike down and deal good damage to, and makes them easy targets for Winged Pikmin. In Pikmin 2's 2-Player Mode, Shearwigs may sometimes pop out when the player digs up a yellow marble. In Pikmin 3, their only Story Mode appearance is in the Formidable Oak, so they cannot be carried back as they just disappear into plasm. They behave as normal in Bingo Battle and Mission Mode. In Hey! Pikmin, they serve as the Queen Shearwig's troops and attacks, similar to Scornets in the Scornet Maestro battle in Pikmin 3. "Shearwigs are essentially Male Sheargrubs with wings. You can pluck a Shearwig from the air with a toss of a single Pikmin, then defeat it quickly with a small swarm. Although it takes some effort to aim and fire at the little bugs, they provide a good source of Pikmin sprouts." "These creatures behave much like Male Sheargrubs, burrowing underground and waiting to attack unsuspecting prey. Once above ground, however, Shearwigs fly into the air and attack your Pikmin from above. When you encounter a group of Shearwigs, move out of range and attack the enemies from a distance. During prolonged battles, Shearwigs will shake their attackers by burrowing underground. Don’t let your guard down until you’re sure the area is clear of enemies." For strategies against the Shearwigs in Hey! Pikmin, see Queen Shearwig#Strategy. The best way to kill a Shearwig is to land a Pikmin directly on top of one; this will instantly kill it. Otherwise, the creature can be swarmed and, provided it does not die right away, the Pikmin should be called back when it attempts to fly upward. At this point it should be shot down by having a Pikmin of any type thrown at it. In Pikmin, Shearwigs share the Male Sheargrubs' invincibility trick while grasping a Pikmin, so a Pikmin thrown directly on its back for a one-hit-kill is a safer method. This invulnerability is lost in Pikmin 2, making for an especially quick and easy kill through simple swarming. In Pikmin 2, Purple Pikmin may also be used to stun large groups of the enemies, which is quite helpful considering that a Shearwig is seldom found alone. Another strategy for Shearwigs that appear near water (such as The Distant Spring in Pikmin) is to bring a group of about 30 Blue Pikmin and lead the Shearwig into the water, quickly swarming it before it can take off. In Pikmin 3, Shearwigs gain a new form of attack wherein as soon as they emerge from the ground, they will immediately take flight rather than attempt to chase Pikmin on the ground. Once in the air, they will swoop down, grab Pikmin in their mandibles, lift them into the air and eat them. The same strategies from previous games are effective on the Shearwig. If in the air, they are also vulnerable to Pikmin being thrown at them to knock them onto the ground, or to get swarmed by Winged Pikmin while in the air. Rock Pikmin can also instantly defeat an airborne Shearwig. To do: Move to the glitches article. In Pikmin, there is a visual glitch that can happen when the Shearwigs in The Distant Spring by the Massage Machine are hiding underground. If they are hiding right on the ledge that leads into the water, they can be seen above ground, completely motionless. In the same game, Pikmin that are thrown or ordered into an area where Shearwigs are under the ground attack the ground as if something were there (similarly to the way White Pikmin unearth buried treasure). However, the Shearwigs will not come to the surface unless Captain Olimar moves near enough. This is useful for when Pikmin need to carry objects through an area with Shearwigs or Sheargrubs (such as the Guard Satellite or the Extraordinary Bolt), as the enemies don't attack, and it can be used to indicate whether any Mandiblards lie ahead. In Pikmin 2's 2-Player Battle mode, Shearwigs may sometimes pop out when the player digs up a yellow marble. Sometimes, the Shearwigs will move incredibly fast, and will eat Pikmin faster, and also move up and down faster when carried to the Onion. The latter oddity may also sometimes happen with Fiery Blowhogs in Pikmin. Japanese name: トビヒメアギト?, lit. : "Flying Princess Jaw"
This creature's name is a combination of "shear" and "earwig" – a real-life insect that also has large mandibles and wings. In Japan, it is known as トビンコ?, which is a combination of とび? (lit. : "flying") and いんこ? (lit. : "parrot"). In its scientific name, Himeagea volaris, volaris is related to the Latin volare, which means "fly". Internally, it is known in Pikmin has kabekuiC. The C in the name is what distinguishes it from the other mandiblards; in particular, the Female Sheargrub uses A and the Male uses B. In Pikmin 2, the internal name is simply tobi, which is part of its Japanese name (とび?, lit. : "flying"), and in Pikmin 3, it is the entirety of the Japanese name (tobinko). A Shearwig in the enemy reel of Pikmin. Artwork of three Shearwigs from Pikmin 2. A Shearwig on the Piklopedia. Two Shearwigs in Pikmin 2. A Shearwig taking flight in Pikmin 2. Two Shearwigs seen from below in Pikmin 3. A Shearwig using the spinning attack in Hey! Pikmin. A line of Shearwigs charging, commanded by the Queen Shearwig. The creature's e-card, #46 (11th red card). The female version of the Shearwig cannot fly, stays underground, and has not been seen in-game, but it has been mentioned in the Piklopedia. The Shearwig and the Wollywog can inflict the most damage on leaders in Pikmin 2: 40% of their health without the Metal Suit Z, and 20% with the upgrade. The Shearwig's exoskeleton covers its entire body in Pikmin and Pikmin 2, but only covers their mandibles and head in Pikmin 3. On The Forest Navel, one can lure Shearwigs into the pathway leading to the Libra, or even to the part's island itself, and get it to fall into the abyss. This can be achieved by making it begin flight while near the edge; at times, the creature will end its flight stage above the pit, and plummet right down. This kills the Shearwig. This page was last edited on April 19, 2019, at 15:52.